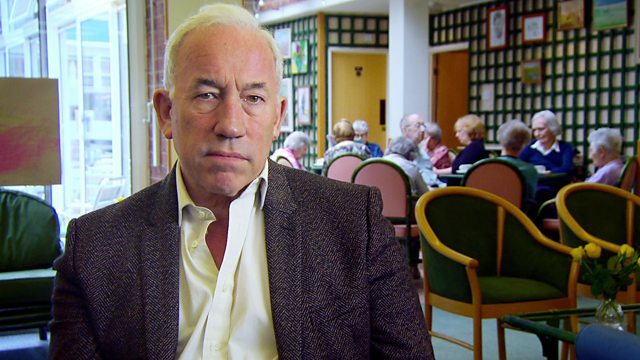 Actor Simon Callow makes an appeal on behalf of Live Music Now, a charity using music and interactive performances to tackle isolation and loneliness in older people. Browse content similar to Live Music Now. Check below for episodes and series from the same categories and more! My mother Yvonne worked hard all her life and brought me up on her own. She was always active and independent. But life for her now, at 94 years old, is very different. she doesn't recognise me, as far as I'm aware. her home, her family, her friends. I'm not alone in wanting a better quality of life for a loved one. Eight years ago, her father David was contentedly retired and married. My mum and dad were married for over 50 years. in that she became more and more immobile. and that became, in his eyes, his life, really. her father David struggled to cope by himself. Well, I think he lost his purpose in life. and Rose had to move him into a residential care home last year. He's now 86 years old. That was at Nicola's christening. Do remember that? as soon as they're in a home, they will withdraw. Now he really doesn't talk to people a great deal. He doesn't like to socialise particularly. I think he finds it almost threatening. become more and more withdrawn from the outside world. can seriously affect an older person's quality of life. cut off from the pleasures of sharing with others. But there is help available from an organisation called Live Music Now. with my mother, so I'm now making this appeal on their behalf. to tackle isolation and loneliness in older people. Nearly half of all people aged 75 or over in the UK live on their own. 82-year-old Betty has lived alone for 16 years. and he was pleased to do it, you know. And if he was happy, well, I was happy. That is the biggest adjustment - living here on my own, really. has made getting out of the house more difficult. easily become forgotten and isolated. because you allow yourself to get depressed. And then you can't be bothered to go anywhere. You do begin to give up. And I don't want to give up yet. Thankfully, there's a charity that's working to help. to bring the joy and benefits of live music to older people in need. and helping to improve their enjoyment of life. in residential homes for the elderly. Hello! How are you? I'm Daire. -Are you a singer or a dancer, Peter? -Oh, I don't believe you! helps them understand the needs of different residents. put them at ease, reassure them. We're going to start with something to get you all moving. This is from My Fair Lady. 'getting people to their feet to move around and dance. 'People often say to me, "Oh, I can't, my legs don't work,"
'and after two songs, they're up and moving around the room. 'So that's quite fun to see. if you make them laugh and cry, you've done a good job. Well, I enjoyed the concert very much. I thought it was very lively and the presenters were very charming. Music makes you feel light. I'd say it was brilliant! Live Music Now is making a real difference to people's lives. at David's care home last year. So it was written on his calendar, which quite amazed me. that Rose and her father could share together again. I suppose you do get a part of your old dad back. and we could both enjoy it together and talk about it afterwards. who are at risk of being socially isolated or live alone. and you're not isolated then at all. You go and you thoroughly enjoy it. And when you come back, you feel better for it. I think it's a tonic, actually, music. in both care homes and the community. But they're desperate to help even more. to older people across the UK who need it the most. Please go to the website, where you can donate. If you can't get through, please, please keep trying. and the whole £10 goes to Live Music Now. writing "Live Music Now" on the back of the envelope. the charity can collect gift aid on your donation worth another 25%. and include the date, your full name and address. Actor Simon Callow makes an appeal on behalf of Live Music Now, a charity using music and interactive performances to tackle isolation and loneliness in older people. The charity believes that music can have transformative benefits for people's quality of life. The film features 86-year-old David, who struggled to cope after the death of his wife, the onset of dementia, and a move into residential care. His daughter Rose has watched her formerly contented, sociable father become increasingly withdrawn from all social interaction. She talks about the genuine difference that the charity's music workshops in David's care home made to his behaviour and to their relationship.